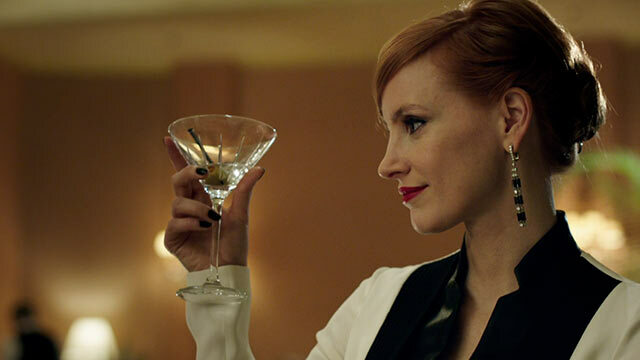 Jessica Chastain is calling on all her acting skills and putting her screen chops on display in this Washington D.C. set drama about the cut throat world of Capitol Hill lobbying. Elizabeth Sloane is 150 percent dedicated to her professional craft and lives, breaths and not eats or sleeps while doing so. She forgoes personal relationship and keeps any family at a distance so as to immerse herself completely in the no holds barred game of cat and mouse that is the life of this political lobbyist. When caught between legislation regarding " the gun and arms question" and the supporters for each side, she makes her choice (the most challenging) and walks out of her old job, with a handful of loyal minion co-workers in tow to join a new firm. Her reputation around Washington insiders is without peer and many entities would love to lure her to their dens to work for them and their causes. Millions of dollars are often at stake and her employers have budgets to match, as she uses them to begin a slide towards the dark side. She considers breaking the law. Staging false events; anything to get ahead and use anything within her means to gain the political advantage as her firm tracks which legislators are in their pockets and will vote on their side of the legislation. Elizabeth Sloane is so totally consumed and driven the audience is not really sure just what she won't do to win. Ultimately, she gets into legal and ethical trouble and must come before an ethics board for a hearing and possible consequences that can ruin her career for good. The film is a American and French production, directed by John Madden (Shakespeare in Love, Marigold Hotels fame) , also starring Mark Strong, Gugu Mbatha-Raw, Alison Pill, John Lithgow (as a corrupt politician) and Sam Waterston. The soundtrack (minor electronica) is scored by Max Richter. The script is sharp, intelligent and quippy all the way around, but it is clear that this is Miss Chastain's vehicle and she is the solo driver. She takes us from total confidence- bordering on arrogance to puddle on the floor panicked heap when things aren't going her way, her driven and constantly calculating character walks and talks a frenzied, but methodical pace and we soon feel that she is headed for a cliff or brick wall somewhere on down the line and her efforts and those of her coworkers seem to start an out of control spiral. The film is more a personality study, it feels, than an introduction into how to lobby. But considered what is going on in the political world around us, with everything citizens feel may be at stake, viewing how possibly things get done in Washington will definitely add to the December chill in the air. All in all, the film is worth checking out if you want to delve into a headier subject.